How often do you hear the words veteran, farmers, and saffron used in the same sentence? Although unusual and perhaps slightly odd at first, Emily, Kim, and Keith, are 3 veterans and founders of Rumi Spice, a company that found a way to capitalize on the spice market while simultaneously helping saffron farmers in Afghanistan. But with a proposal of $250,000 for 5% stake in the company, will the sharks see this as a sweet deal, or will they be left with a sour taste in their mouths? Although most people associate Afghanistan with war, terrorism, and opium, these three entrepreneurs managed to find a very different side of the country while serving on the US Army. With violet fields spanning across the land, it didn’t take much time for this trio to figure out that one of the most expensive spices in the world was widely available all around them: saffron. When back in the US, Keith reached out to Kim and Emily, both being graduates of Harvard Business School. After decades of war, Afghanistan has been left out of the international marketplace. With a huge supply of an expensive commodity, an increasing demand, and no one capitalizing, Emily, Kim, and Keith ended up stumbling into what is seemingly a gold mine. In a way to empower and help the local farmers, the three entrepreneurs decided to work directly with these Afghan farmers in a way to also boost the local economy. As the entrepreneurs later mentioned, you may also buy saffron from Spain, although 90% of the country’s saffron exportations are actually from Iran, which is likely not as fresh nor aromatic as the one from Afghanistan. But how expensive really is this sweet spice? You may be surprised to find out, but the retail price is $18 for 1 gram, or $140 per ounce (just over 28 grams) directly to restaurants. The reason it’s so expensive it’s because all saffron has to be handled and processed manually, taking about 150 hours of labour to have one gram. Next up, the trio also explained that one bottle of saffron is sold for $35 retail, with a production cost of $8.30. There was no mention as to the amount of saffron in that specific container. As Daymond questioned them about the valuation and sales, he had a concern that the entrepreneurs would not be able to actually help the farmers. Emily then explained that the profit made is reinvested back into the infrastructures in Afghanistan and, despite being a for-profit company, they also want to help the Afghan farmers. As profit was mentioned, Kim shared that the company has made $400,000 in sales so far, and they are on track to make $750,000 by the end of the year. Kim also mentioned that the saffron sales in the United States are just above $60 million per year, with the combined spice market being around $10 billion dollars. Although it may seem like a small percentage of the spice market, saffron is the highest-grossing spice on the market. More than a spice company, the entrepreneurs want to turn Rumi Spice into a brand. Through their partners Blue Apron and through other specialty retailers, they wish to reach the general consumer and introduce them to something new. The entrepreneurs seemed extremely well prepared and knowledgeable on the topic, discussing several chefs they have worked with as well as several future markets they could expand to, such as the tea market. Mark then questioned if there were any political risks when it came to working with Afghan farmers, which Keith quickly explained there was no risk nor conflict of interests. First off, Daymond shared some of his opinions about Rumi Spice. He praised the company and their goal for helping farmers, as well as the product. On the other hand, he believes the product is too expensive for the regular consumer, therefore backing out of the chance to invest. Lori was the next one to compliment the trio on their hard work and willingness to help others. Quite unfortunately, she does not like saffron and decided to not invest. As Kevin started to ask more about their profit, it was revealed that by next year the company should make $1.5 million, although the profit margin is only 5%. Quite surprisingly, Kim seemed to struggle when trying to justify the low net-margin and could not give a coherent answer as to what the profit will be next year. Kevin then explained he believes the valuation is too high and it doesn’t correspond with the profit the company has made. Keith took over and explained the money made so far has been reinvested into infrastructure and the company is expected to start making a profit by the end of the year. A long and heated argument soon followed, with Kevin questioning Kim’s knowledge, and Kim defending herself. Kevin ended up not investing after sensing the entrepreneurs didn’t even know their business model well enough to know the profit margin. On a positive note, Mark soon followed and decided to place an offer. He mentioned he has invested in several military-based companies and therefore has some expertise to offer in this field. He ended up offering $250,000 for 15% stake in the company, non-negotiable. The entrepreneurs didn’t even have time to think about Mark’s offer when Robert decided to place his own proposal: $250,000 for 25% equity. In a quite odd turn of events, Robert immediately withdrew his offer, claiming Mark’s offer was better. With just one offer on the table, the entrepreneurs eagerly accepted Mark’s offer. 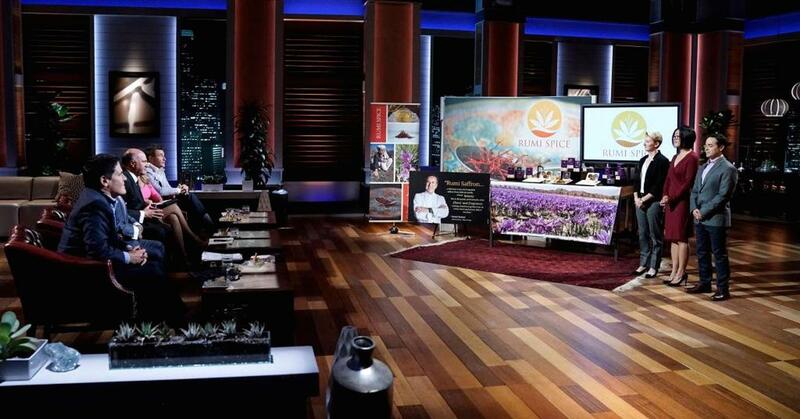 What happened to Rumi Spice after Shark Tank? Although it’s still very early to have any update on Rumi Spice, the product has caused quite a stir online. A good cause, a good product, and a smart investment set twitter into frenzy trying to find where to buy Rumi Spice. If you would like to try something new and impress your loved ones with a flavorful yet exciting dish, don’t hesitate to visit their website rumispice.com to get your own Rumi Spice or purchase directly online. Rumi Spice is the highest quality saffron sourced directly from Afghanistan and harvested by hand by Afghan farmers. The spice is tested rigorously in accordance with ISO 3632 standard. The medicinal properties in saffron provide many health benefits. Check this video below to see how this product is made.